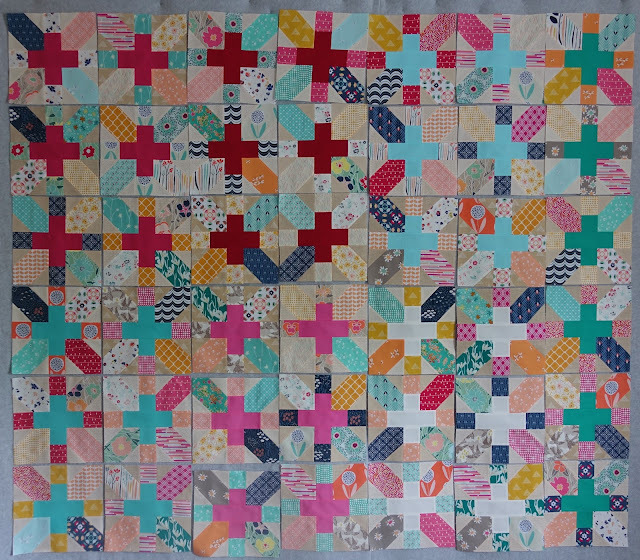 I finished piecing my X's & +'s blocks, and while I try to avoid having an unfinished project on my design wall when I leave for vacation, in this case it was very easy to get back in the swing of sewing having all the fabric cut and just ready to be pieced together. I think I only had 12 blocks to finish when I started back up. I pieced my blocks in 7 groups, 6 blocks in each group. Seven groups because of the seven different solid center fabrics I selected. Here are the pieced blocks but not in their proper placement. 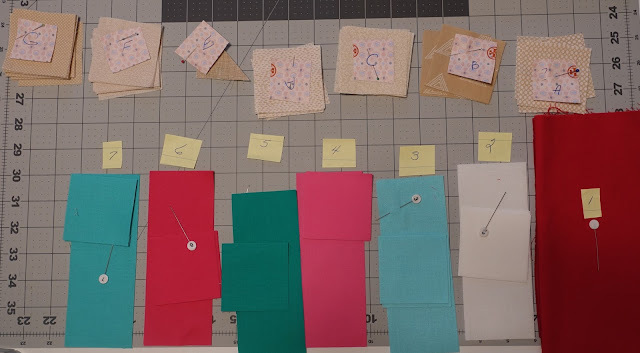 Normally when I'm piecing a scrappy quilt, I put the pieces and parts on my design wall to get the "perfect" placement of each piece of fabric before sewing the blocks together. (plus avoid like fabrics touching, my all time pet peeve) That's pretty time consuming and I've often wondered if it was really worth my time. So for this quilt I threw caution to the wind and just randomly selected my pieces and parts as I went along. Now as I mentioned in my previous post, like solid center pluses run diagonally one way, and like corner fabric diagonally the opposite direction. So while most of the fabric for each plus block could be random, the corner fabric had to be in a certain order. 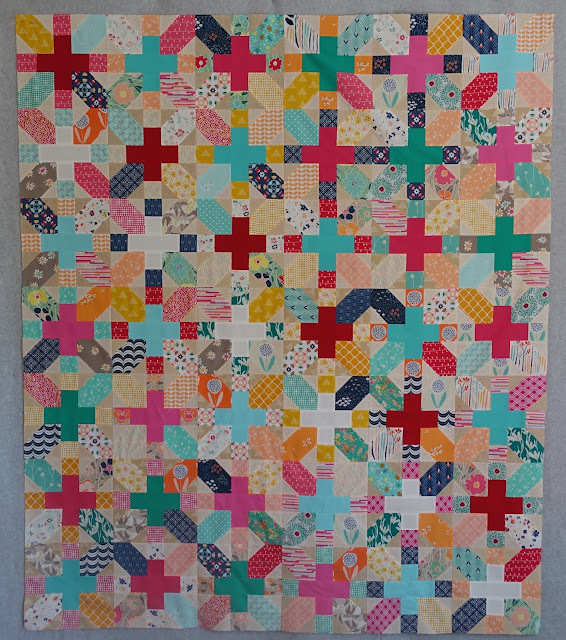 This is a picture of Cindy Laman's finished Xs and +s quilt. I used it basically as my legend to piece the correct corner fabric for each plus fabric. The plus fabric was numbered, the corner fabric was alphabetized. Once all the blocks were pieced and put in their proper place on the design wall, I was very happy with the look, so maybe I don't need to place all my fabric on the design wall then piece my blocks. I really like how this quilt finished, it's the kind of quilt you need to look at awhile to take it all in. The solid plus fabric catches your eye immediately, but the diagonal placement takes a little longer to notice. The like corner fabric running diagonally the other direction is very subtle but a nice little surprise when you notice it. The pattern is X's and +'s by Pat Bravo Designs and is available here. The fabric is an assortment of Art Gallery Fabric, mostly Jenni Baker. It finished at 60" x 70"
It has approximately 798 pieces. Next up, my favorite step after finishing a quilt, making some Village scrap houses! Wow, love it, colours & design. Congrats Thelma. Love love love it! I organized and numbered my fabrics the same way. Worked great! This quilt came together very nicely, Thelma. I've had a slow sewing season for the past five months or so, but I did get a Farmer's Wife quilt finished. I have a long, long list of projects to do so I'd better get busy. Take care! Your quilt is beautiful! Especially love those reds and aquas!